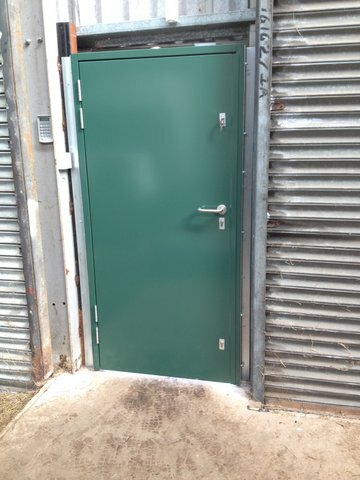 About Security install a range of steel security doors in Bristol and the surrounding area of various designs that will suit all requirement including fire exit doors, general purpose steel doors, high security steel doors, communal doors, sub-station doors, louvered doors and certified fire doors. 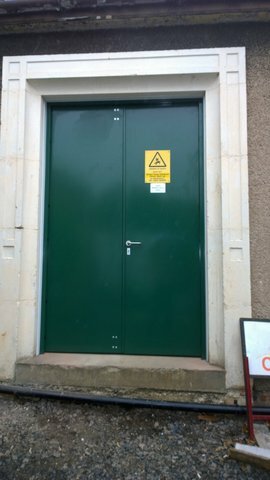 The most common timber doors we replace are the rear fire exit doors of buildings as standard timber doors and timber frames are often the target and means of entry by burglars in many cases with timber doors situated at the rear of the building or in secluded areas where thieves can work on the doors for considerable lengths of time undiscovered, Unfortunately a high proportion of these doors suffer from neglect and lack of maintenance and consequently deteriorate so it is important to fit doors that will not rot, need none or very little maintenance and are as strong as possible to withstand attacks. 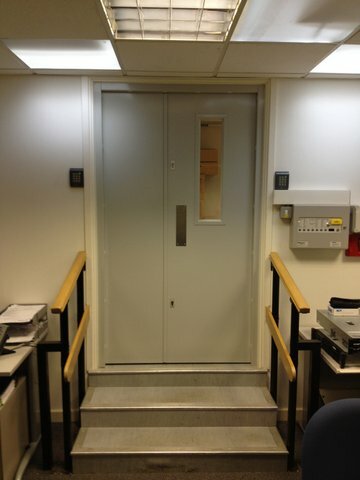 Pound for pound the steel door offers a cost effective long term answer to replacing doors that require a good security level, it is surprising how the total cost of fitting a timber door escalates when you take into account the door blank or sash, timber outer framework furniture required, any additional locks, painting or staining required and finally the labour cost to fit all this, and then after all of these costs added together you still have a wooden door that will require ongoing maintenance and offer minimal security levels, why not fit a steel door and forget it. 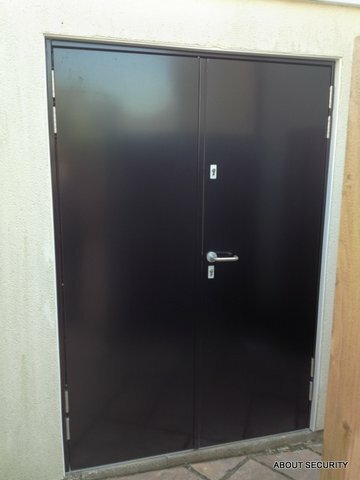 Our steel doors are made to measure, will not rot, are not weakened by fitting additional locks and can be powder coat paint finished to any RAL colour. 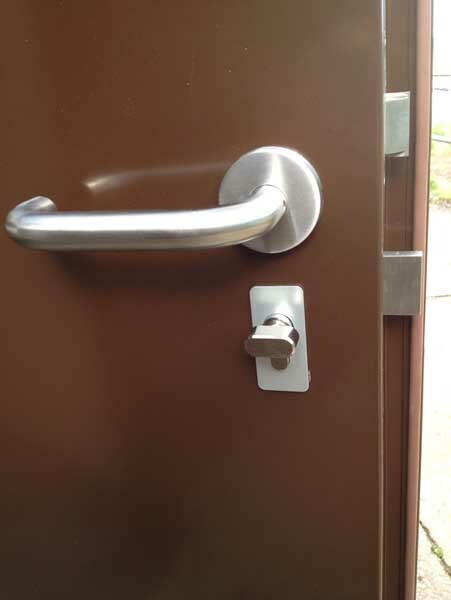 The most commonly fitted personnel steel doors we fit consist of steel door sash with steel outer frame, choice of hardware including fire escape panic furniture, additional upper and lower deadlocks, low level DDA compliant threshold, steel dog bolts to the hinge side and stainless steel hinges as standard, finish of the doors and frames can be any of a full range of standard RAL colours. 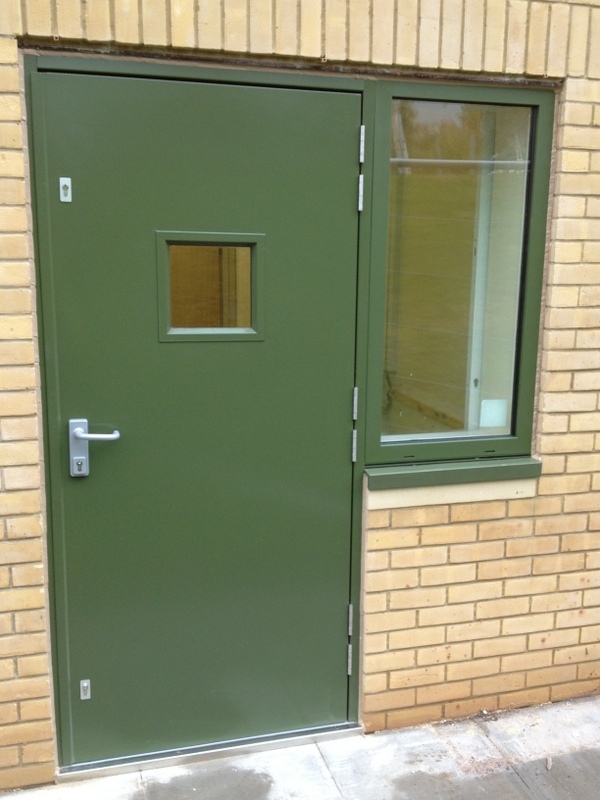 The doors can also be fitted with Rockwool insulation for improved thermal efficiency if required. Many other options and styles are available but this is by far our biggest seller and is highly rated by our customers. 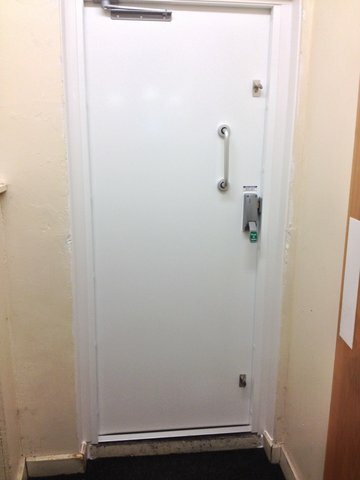 We offer doors manufactured to various LPCB security levels for different applications and customer requirements l but have found that our standard and most used door has successfully withstood attacks on a number of installations. 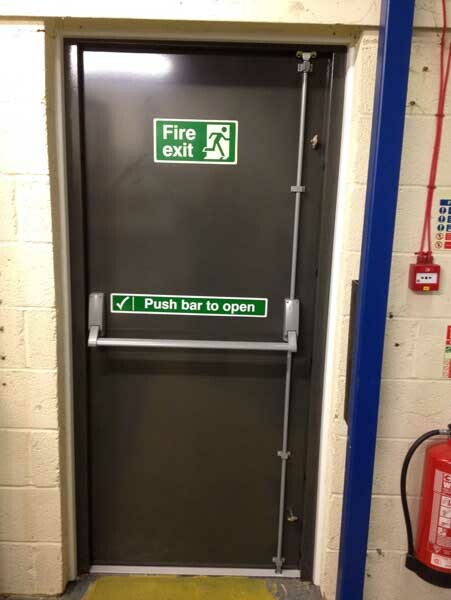 A full range of furniture and locking options are available to fit to our steel door range and we can accommodate most customers’ requirements; fire exit panic furniture, mechanical and digital locks, electrical release locks and magnetic locking methods etc. for both domestic and commercial applications and a couple of other examples are listed below. 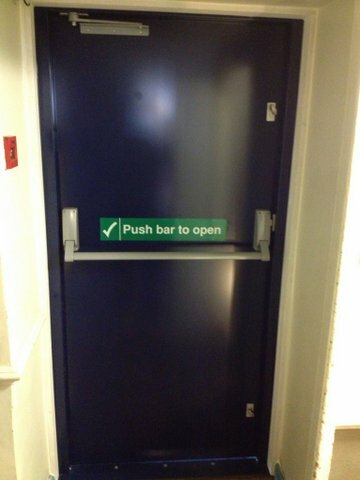 Please call us for more help and advice with your steel security doors in Bristol. 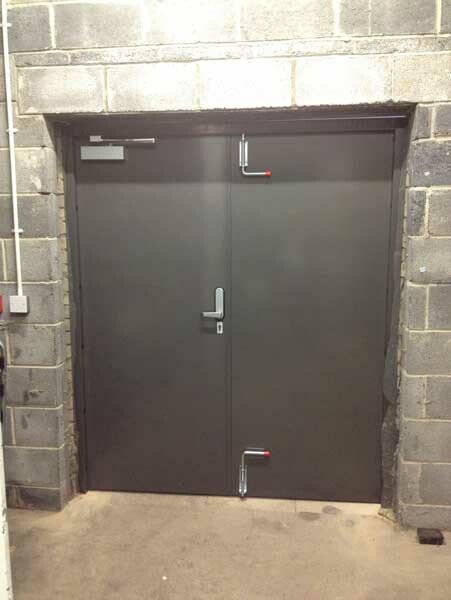 Sub station doors are punched steel door panels for air circulation and can be manufactured with optional upper panel and removable transom for higher equipment access, available as single door, double doors or bi-folding doors and available in a full range of standard RAL colours . We can now take payment via card, we accept all major bank and credit cards (Except American Express). © 2019 About Security. All Rights Reserved.